4 pc. 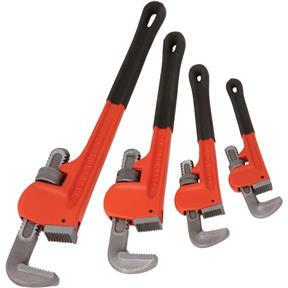 Pipe Wrench Set 8", 10", 14", 18"
Grizzly H6271 - 4 pc. Pipe Wrench Set 8", 10", 14", 18"
Heavy cast iron construction, paired with extra tough hardened steel jaws, make these pro-quality pipe wrenches ideal for the shop or home. Thick foam coated handles are extra long for added leverage. Machined steel lower jaws are removable for sharpening. In four convenient sizes. This is a great set of pipe wrenches and i am very satisfied with this set. Price was amazing in comparison to local stores.